On July 15, 2010, Peter Hart, a 54 year old professional musician and brass instrument repairman was in Door County, Wisconsin for a sailing trip with relatives. Although Peter lives in Iowa, he grew up in Door County and graduated from High School there. Peter wanted to have lunch at Al’s Swedish Restaurant and decided to ride his mountain bike to the restaurant in Sister Bay from the Ellison Bay area. The trip would be about six miles each way. The weather was clear and sunny and the time was about noon. Peter was riding his bicycle on the wide right shoulder area of the road which was separated with a white line. As Peter approached a parked white truck ahead, he slowly maneuvered around the truck on the left side. As Peter was next to the white truck, he was struck from behind by a 17 year old driver and knocked unconscious. He flew through the air and landed about 10 feet in front of the parked truck. He was taken via ambulance to the emergency room where he was diagnosed with a concussion, broken collarbone, and other injuries. The driver told police that he looked down at his radio and when he looked back up, Peter was “coming around” the parked white truck. The driver’s phone records showed approximately 500 texts in the 24 hour period surrounding the collision including several at/near the time of the collision. The driver never even called 911 and then lied when asked about whether he called 911. Deputies interviewed Peter at the hospital shortly after the collision and while he was medicated. The Deputies cited Peter for failure to yield the right of way. The citation was later amended by the Door County D.A. to sudden movement into traffic. The driver was not cited for anything even though he later admitted not giving Peter three feet before attempting to pass and gave a written statement admitting to looking at his radio just before the collision. Photos taken by the investigating deputies showed a skid mark crossing from the motor vehicle lane into the bicycle lane from left to right. At trial, a deputy testified he thought this was a bicycle tire skid mark and not made by the car that hit Peter. Fortunately the jury was able to examine Peter’s bicycle in the jury room and see that the tires had not lost any rubber. The skid mark was also about three times as wide as the white fog line clearly showing the skid was from the car not a bicycle. The skid mark ended at the front tire of the parked truck. The driver’s car had rubber transfer on the front right bumper near where the car hit the truck tire. When the deputies were asked at trial about Wisconsin’s three foot law for bicyclists, they testified they were not aware of the three foot law. 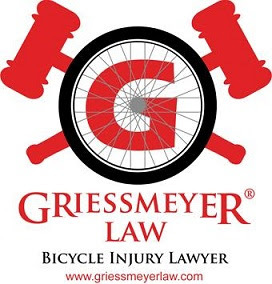 Peter, through his bicycle injury attorney, Clayton Griessmeyer, was forced to plead no contest to the citation even though he knew the driver was at fault. The 17 year old driver’s insurance company, Allstate, demanded payment for the car damage from the collision with Peter. Peter went through months of physical therapy and began forgetting things due to his concussion. His family members became very concerned about the changes in him. He worked in pain while still in his sling and had difficulty rolling dents out of large instruments like the sousaphone. Things that he loves like fishing and hunting became quite difficult due to his injuries. Peter and attorney Clayton Griessmeyer were forced to sue Allstate and the driver and his father. After a three day jury trial, the Door County jury found the 17 year old driver 80% at fault and Peter 20% at fault. They awarded a total of $98,099.69 in damages including $80,000 in pain and suffering. This was about seventeen months after the collision. The trial judge later reduced the verdict by $2,525.00. Fortunately, Peter did not die and is still able to bicycle like he has most of his life. 1. What is your bicycling background? My bicycling background goes back to the 1960's growing up in Monona, Wisconsin, biking around Lake Monona all the way to down town Madison. I biked to school every day. I have memories, as a kid, of following the bug spray truck around the lake on my bike. I enjoyed riding through the fog. ( I hope I didn't receive too much DDT.) 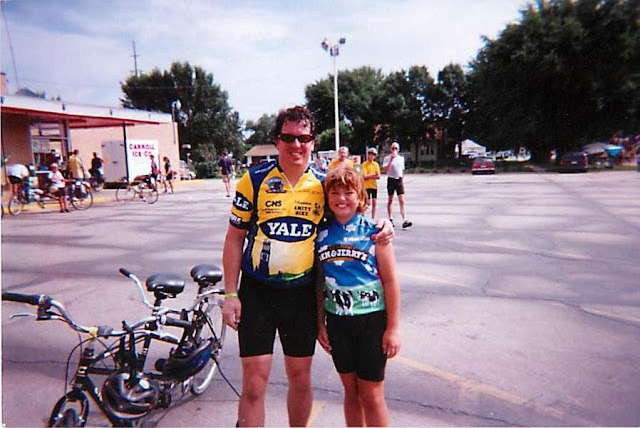 As an adult I have biked in eight RAGBRAIs to raise money for charity. 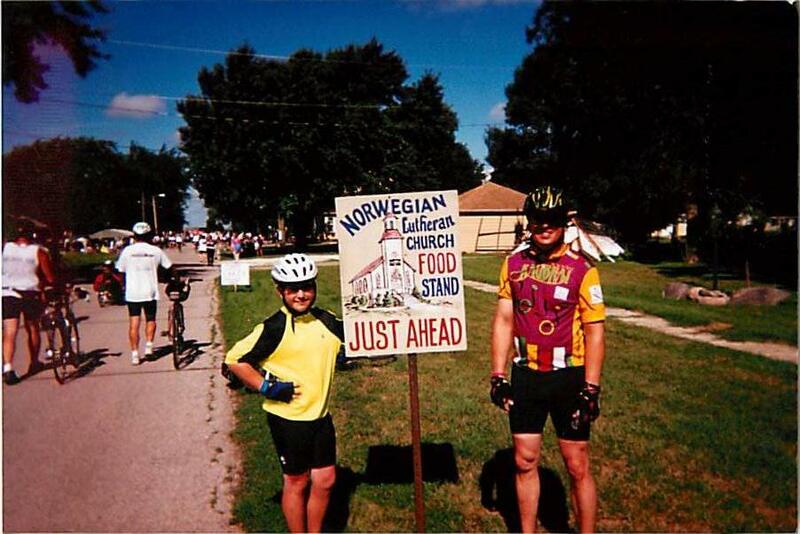 There are 10 to 20 thousand bikers riding across the state of Iowa in one week: averaging around 80 miles per day. Camping along the way and meeting people from all over the world is an adventure. I currently own four bikes: my original ten speed steel Motobecane with the leather seat I bought in High School back in 1974, a tandem Burly mountain bike that I have ridden many RAGBRAIs with my son Roland and daughter Stella, a Cannondale aluminum mountain bike, and a Cannondalle carbon road bike. I bike almost every day now since the case was resolved. I did not bike at all after the accident since my balance was off and I did not feel physically strong enough. In college I used to bike long distance trips where I would camp along the way up in northern Wisconsin, hauling my tent, sleeping bag, and clothes, on my ten speed. I even packed my tenor sax in an army duffel bag so I could bike to practice my scales out in the remote places on lakes in the woods. I got some strange looks from boaters but it paid off since I got into Eastman School of Music to study saxophone. 2. How are you doing these days? Today I am almost back to normal. I am still forgetful since I have a really busy schedule. I play in six bands, perform in shows as a pit musician, teach sax lessons, and repair band instruments full time for West Music Company. I am doing lots of trout fishing and mushroom hunting right now. 3. What was the most frustrating part of what happened? The most frustrating thing about what happened to me was that it seemed so unbelievable that a bicyclist, getting hit from behind by a car, would be charged by the police. Adding to my astonishment was the bill from an insurance company for the damage to the car that struck me. All the driver had to say is that I swerved, which was not true. 4. What advice do you have for other bicyclists in Wisconsin? My advice to other bicyclists is to always wear a helmet and pick routes with low traffic. Motorists are distracted today by electronic devices. 5. What do you think of the legal system? The legal system really does work. I wanted to fight the ticket since I was so insulted by the lie that produced it. I called a really good attorney who had the knowledge to let me know how to proceed. It sure was expensive to file a law suit. I did not know the bike laws but my common sense dictates that motorists do not have the right to run you down just because you are on a bike. 6. What was it like to get hit by a car going 20 mph? Getting hit by a car is a surreal event. You wake up not knowing what has just happened. Then you are treated by police as though you are guilty of a crime. My opinion of law enforcement has changed (even though I have a brother who is a D.A. and another brother who works for law enforcement-- Internal Affairs at the U.S. Treasury Department. My feeling as a victim changed after I called an attorney and he assured me I had done nothing wrong. I even felt as though my wife did not believe me at first. Everyone seemed to regard me as a crack pot. " Why does a 54 year old man need to be out on a bike?" " Is there something wrong with this guy?" I bike to lower my blood sugar since my doctor told me I needed to lose some weight and get more exercise. I have loved biking my whole life. 7. What was it like trying to recover from your injuries? It was a long process healing from the accident. I went through physical therapy and was tired and forgetful. Memory has come back somewhat, and I am able to do most things I did before. but I get fatigued quicker. I am going to try to ride just two days of RAGBRAI this year. 8. What was it like telling a jury about what happened to you? Telling my story is important to me, to protect bicyclists. My parents told me to "forget about it-- pay the fine-- buy the car driver a new front bumper-- get back to work and put it in the past." I am really glad I did not take Dad's advice, but rather, hired an attorney and filed the lawsuit. I had my day in court to tell what happened. I felt the jury connected with my description of the events. The attorney for All State seemed to want to suppress evidence and confuse the jurists. The jury was comprised of intelligent people with good judgment. 9. Do you feel justice was served? Why/Why Not? I do believe justice was served. The judge was sharp and seemed intent on following the law. The jurors all seemed focused on the facts. They seemed to keep their interest focused through long hours of testimony. 10. How can we make roads safer for bicyclists? Safer bicycling could be achieved through the creation of public awareness of the "three-foot law", which states you must give bicyclists three feet when passing them. The police did not know this law. The attitude among some motorists and police in Door County is that cars have a right to plow through the roadway without granting bicyclists their space while passing them. People should know that the police do not make the laws. Nobody has the right to injure you and then use their insurance company to get money from you. When my wife Lynne contacted All State insurance the agent said there were no injuries reported in the accident statement from the driver. The driver lied to police, lied to his insurance agent and during court proceedings kept changing his story. I think it would be a good idea to help bicyclists become aware of the potential hazards caused by inattentive drivers. The incompetent police work and unethical treatment by All State insurance is also disturbing. *This article and interview is not an advertisement. It was written for the purpose of educating bicyclists about motorist’s behavior and to inform bicyclists that many drivers and even police are not aware of Wisconsin’s “Three Foot Law.” Do not expect motorists to give you three feet space just because there is a law that says they have to. Every case depends on the facts of the individual case and results vary. Do not assume similar outcomes can be obtained. The above interview was made by an actual past client. This is not a paid testimonial. My office address is 403 Venture Court Suite 2, Verona, WI 53593. Attorney Clayton Griessmeyer.